Indian Country’s Changing Landscape offers a reversal of those ideologies into decolonial data-visualizations. Settler colonialism, genocide, and imperialism included are often normalized in U.S. ideologies. 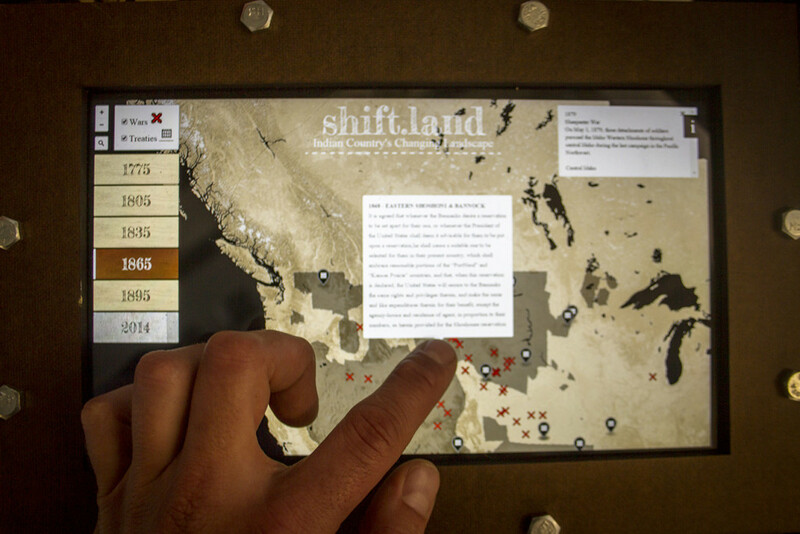 Shift, Indian Country’s Changing Landscape offers a reversal of those ideologies into decolonial data-visualizations. Data of and from the Indigenous peoples of the area now known as the U.S. constitute Shift, an immersive and colossal, yet intuitive display. Vine Deloria, a Native scholar defines true liberation as “chang[ing] the way that Western peoples think, the way they collect data, which data they gather, and how they arrange that information.” Shift visualizes Indigenous data-sets (population, land area, wars, and treaties from 1400-2014) into an immersive and colossal, yet intuitive display to re-teach American history.